All across the world, people want decisions taken at a local level. The days of centralised, one-size-fits-all organisations are gone. They aren’t coming back. We can either put our heads in the sand or adapt to face this new reality. The last Labour Government led the way on devolution for the country. The Scottish Parliament, the Welsh and Northern Ireland Assemblies, the London Assembly and much more. We transferred huge amounts of power across the country, and we are a better nation because of it. What we failed to do, though, was to devolve our party at the same rate. The powers that the devolved legislatures in Scotland, Wales and London had were way ahead of what the parties in those parts of the country had. That has to change and under my leadership it will, for Scotland at least. I have a plan to make Scottish Labour a more autonomous part of our UK-wide movement. I am proud that we are part of something bigger. As the old saying goes, unity is strength. The co-operation we have across the UK is one of the unique selling points for our party, but we need to evolve with the times. In my leadership contest I set out the direction of travel on autonomy, and received a huge mandate for this with 72% of the vote. I have a bold and radical plan that will see a major transfer of power to Scotland. My plan is for decisions about UK General Election selections, the management of local Constituency Labour Parties, party membership and many other things to be taken by Scottish Labour. The entire focus of the Scottish Labour Party must shift away from Westminster and on to Holyrood. When the major new powers from the Smith Agreement process are delivered the Scottish Parliament will be one of the most powerfully devolved legislatures in the world. Decisions not only about schools, hospitals, policing and transport will be taken in Holyrood. The Scottish Parliament will have to set the rates of income tax for Scotland and develop our own social security system with new welfare powers. The Scottish Labour Party must therefore be fit and ready for the future. We need to show people that our party’s priority is how we can use these new powers to make Scotland a better place to live. To build that fairer and more just society that we seek. More autonomy for Scottish Labour is a critical part of that process. But here’s the thing, this isn’t a break up. Far from it. A federal solution to our party structures doesn’t split us apart, it ensures that our unity endures. We all know what happened in Falkirk. It wasn’t the finest hour for our movement. But regardless of what caused the problems there, there was a perception that the Scottish Labour Leader was powerless to act. That can never happen again and under my plan it never will. This isn’t going to be an easy process. Resolving questions about staffing, finance and much else will be very technical and difficult. But it will be worth it. Tomorrow night (Monday) I will be speaking at the meeting of the Parliamentary Labour Party in the House of Commons, to explain my plan for Scottish Labour autonomy. I will also be urging the rest of the UK Labour Party, in good faith, to think about their own future. The tectonic plates of politics are shifting – there is a yearning for the devolution of powers to our nations, regions, cities and towns. We need to get out ahead of that debate, instead of getting left behind like we have done in the past. If it’s good enough for our communities, it’s more than right for our party too. I want more autonomy for Scottish Labour to start the firing gun that sets off the devolution of more powers to the party in Wales, the Midlands, the North West and elsewhere. I bring this message from Scotland in strong terms but in good faith and with the warmest of fraternal wishes: Learn your lessons from us, don’t repeat our mistakes. Don’t let yourselves be reluctant converts to an inevitable process of change. Don’t defend the status quo. Reform and innovate and in so doing, meet the hopes and aspirations of the very people we collectively seek to serve. 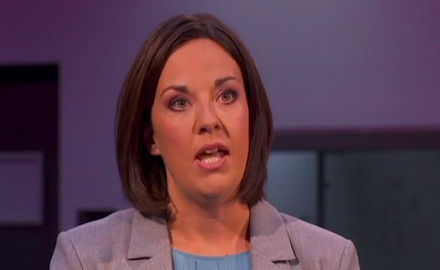 Kezia is a Scottish Labour Party activist in Edinburgh where she lives and works. Kezia blogs at www.keziadugdale.com.